Jean-Michel Basquiat (1960 –1988) was one of the most fascinating and controversial personalities in the art world. After starting on the New York underground scene as a graffiti sprayer, musician and actor, he began to devote himself to painting at nineteen. His highly expressive, energetic work soon found wide admiration. Supported by Andy Warhol, he advanced to become an internationally acclaimed star. He was the youngest Documenta participant ever, and exhibited at Art Basel, the Venice Biennale, and various famous galleries. The son of immigrants from the Caribbean, Basquiat became the first black artist to make a highlevel breakthrough. He collaborated with Keith Haring, Francisco Clemente, Debbie Harry, and many other stars. In the space of only eight years, he created an extensive oeuvre of about 1000 paintings and 2000 drawings before his tragic death at the age of only twenty-seven. 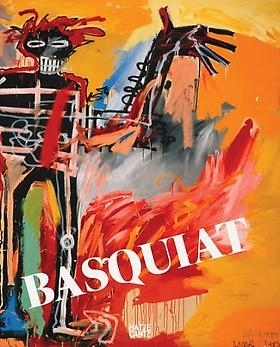 To mark his fiftieth birthday, the Fondation Beyeler is devoting a large retrospective to Jean- Michel Basquiat, comprising more than 100 paintings, works on paper, and objects from renowned museums and private collections around the world. His works, populated by comic- like figures, skeletal silhouettes, curious everyday objects, and poetic slogans, are highly colorful and powerful. They blend pop culture and cultural history into critical and ironic commentaries on consumer society and social injustice. The exhibition brings together many of Basquiat’s major works and illustrates the development of this legendary art scene star. Renowned museums, galleries and especially private collections in Europe and America have contributed to the success of our undertaking by generous provision of loans. These include The Museum of Modern Art, New York, The Whitney Museum of American Art, New York, the Musée national d’art moderne, Centre Georges Pompidou, Paris, the Museum Boijmans Van Beuningen, Rotterdam, The Broad Art Foundation, Santa Monica, The Brant Foundation, the Daros Collection, Switzerland, The Estate of Jean- Michel Basquiat, New York, the Fondation Louis Vuitton pour la création, the Rubell Family Collection, Miami, the Galerie Bruno Bischofberger, Zurich, the Tony Shafrazi Gallery, New York, the Gagosian Gallery, the Galerie Jérôme de Noirmont, Paris, Lio Malca, New York, Fred Hoffman Fine Art, Enrico Navarra, The Steven and Alexandra Cohen Collection, the Mugrabi Collection, Irma and Norman Braman, Amalia Dayan and Adam Lindemann, Laurence Graff as well as John McEnroe. The exhibition was conceived by the Fondation Beyeler in collaboration with the Musée d’art moderne de la Ville de Paris, where it will be on view from October 15, 2010 to January 30, 2011. It has enjoyed the support of The Estate of Jean-Michel Basquiat in New York and the artist’s major dealers and collectors. Curators and catalogue editors are Dieter Buchhart and Sam Keller. The exhibition catalogue, published in a German and English edition by Hatje Cantz, Stuttgart, was designed by Marie Lusa. It contains essays by Dieter Buchhart, Glenn O’Brien, and Robert Storr, an interview with Basquiat by Becky Johnston and Tamra Davis, previously published only as a video film (1985), and short texts by Michiko Kono and a chronology by M. Franklin Sirmans. 244 pages, 334 illustrations, CHF 68. Opening hours of the Fondation Beyeler: 10 a.m. – 6 p.m. daily, Wednesdays until 8 p.m.